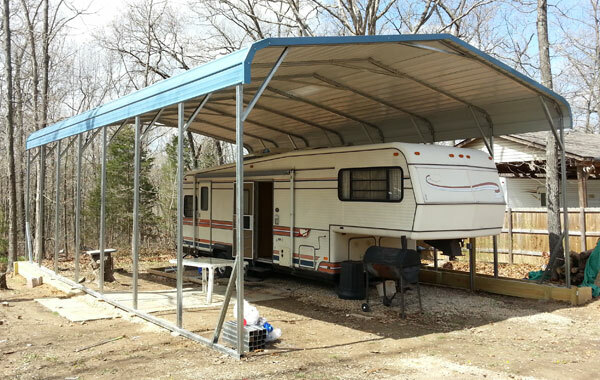 A metal RV carport from Alan’s Factory Outlet is easy to set up and protects your vehicle from damage caused by harsh weather conditions with sturdy covered RV storage. Many of our RV carports for sale have a roof with one or two walls to form an effective RV canopy; the differences in design depend on the specific model. But no matter how you customize yours, our RV storage buildings can offer something unique to your property. An RV carport with a vertical-style roof, an optional 3-foot panel on both sides, and an enclosed back end protects this mobile home. 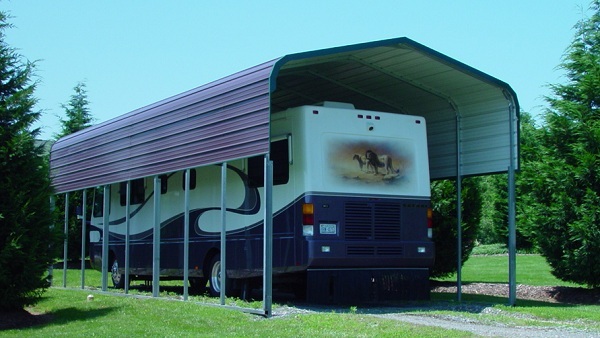 We strongly recommend a vertical-style roof for any RV shelter that is 41 feet long or longer. How Much Does an RV Carport Cost? Metal RV covers in our inventory cost start between $1,095 and $4,195 and more, depending on the size of the structure and its roof style. We carry carports as large as 24 by 41 feet and 16 feet high, and we can customize one that’s even larger if you’d like, so you’ll have plenty of space for your camper or RV. At Alan’s Factory Outlet, we have RV shelters for sale made with sturdy metal sheets that wrap around the support structure to create a roof and two partial sides or a roof and one full side. 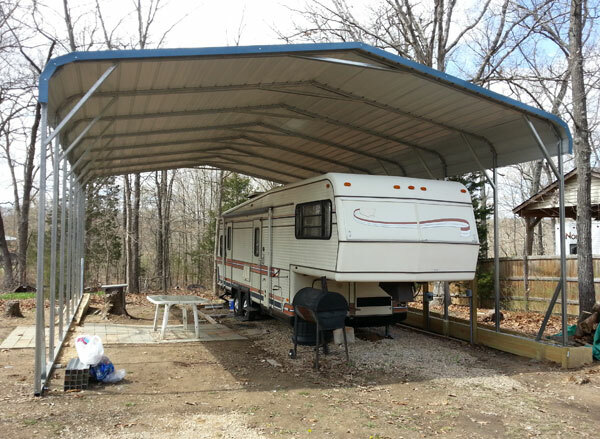 Carports that are partially enclosed provide ventilation while still protecting your property. Another benefit of our partially enclosed RV carports is that you’ll have easy access to your vehicle to clean it, load it, or just climb in for a quick inspection. But if you prefer, we also have affordable RV storage that is entirely enclosed. When you order one of our metal RV covers, you get a choice of three roof styles: regular, boxed eave, and vertical. There is an advantage to choosing a vertical roof for your RV: Metal carports with this type of roof don’t experience snow buildup. Because of the roof’s vertical sheeting, the snow slides off the side before it can accumulate. The regular and boxed-eave styles have sheeting that runs horizontally across the length of the building. Why do our customers need motorhome covers? Metal RV covers prevent the snow, rain, and hail from causing rust and otherwise damaging your RV. Metal carports are stronger and offer more protection than a cloth tarpaulin: Cloth can cave in and tear, leaving your RV vulnerable to the elements. And you don’t even need to own an RV to benefit from camper covers: For RV owners, they offer protection for a costly vehicle, but if you’re not an RV owner, a portable RV carport can also serve as year-round shelter for your car, truck, motorcycle, or ATV. And once your carport is set up, it requires no additional maintenance. This 12-foot-wide, 36-foot-long, 12-foot-high regular-style RV carport has one extra 3-foot-wide panel on both sides. Alan’s Factory Outlet has a wide selection of metal RV carports available to buy online 24/7, and we can also customize RV carport kits to suit your needs. And we’ll deliver your steel RV carport and install it for free in many states. Order camper covers from us and you’ll see how simple and affordable it can be to protect your RV or camper! A regular-style metal RV carport, 12 feet wide by 36 feet long by 12 feet tall, is shown with one side closed and 4-foot braces. We know that RVs come in all shapes and sizes, and that makes it all the more important to choose the right metal RV covers. For RV owners, we are proud to provide a selection of covers and garages in a variety of sizes as well as more than a dozen color choices for the roof and trim. We want you to purchase the RV carport that meets all of your expectations! 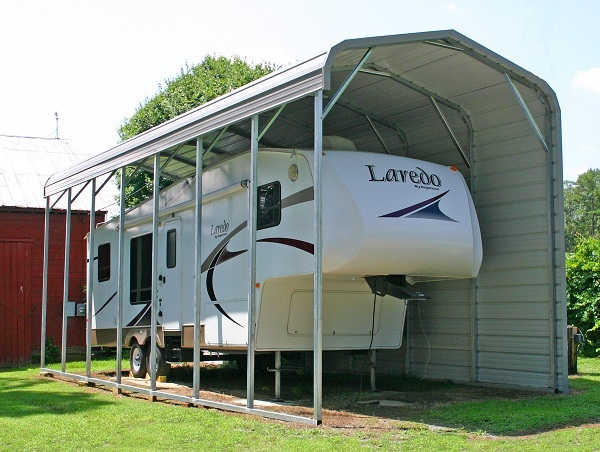 How do you know that you can feel confident about the quality of our RV carports? We anchor your metal RV cover to the ground, asphalt, or concrete at no charge. There’s a 20-year rust-through warranty on the metal framing on these RV garages for either the 14-gauge tubing or optional 12-gauge tubing. Optional mobile home anchors can help create certified RV carports rated for 140 mph wind and 30 psf. Each carport comes with a 1-year workmanship warranty from the date of installation. This 18-foot-wide by 36-foot-long by 12-foot-tall RV garage has a regular-style roof and is fully enclosed. With these RV storage buildings, our customers get peace of mind knowing that their valuable assets are being well-protected. After placing your order for an RV garage kit, the approximate installation time for any of our RV ports varies from state to state. Please call for the exact delivery time for your location. What Is the Size of an RV Garage? Our RV shelters for sale range in size from 12 by 21 to 24 by 41 feet. Do I Need a Permit for Covered RV Storage? This depends on the local laws where you live. Every area has different laws, so it’s definitely important to check the rules in your location. How Big Should an RV Garage Be? RV trailer covers usually need to have at least 14 feet of clearance and should be 12 to 16 feet long. Our smallest available size is a 12-by-21-foot model. What Does it Cost to Build a Metal Garage? If you upgrade your covered RV storage to a fully enclosed structure, you can expect to pay from $2,955 to $7,725 or more depending on the size of the structure. Like with our carports, delivery and setup are included in the cost.